WaveGrip, the leading provider of sustainable beverage multi-packing solutions, has launched its latest carrier innovation for the growing number of slimmer, sleek style cans, which are now increasingly popular across a variety of alcoholic and soft beverages. The new WaveGrip Sleek is value-engineered to be lighter but stronger, while securely collating cans to the rigorous standards required in the retail sector. Its launch also continues WaveGrip’s focus on delivering the most environmentally sustainable multi-packing solutions available for beverage cans. 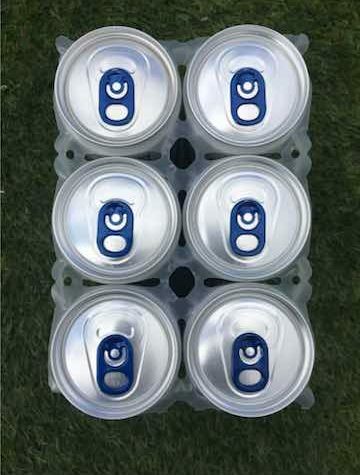 At less than 2.25g per six-pack carrier, it offers significant packaging material savings and environmental advantages compared to standard six-pack rings, rigid plastic handles and traditional cardboard carriers. Each WaveGrip Sleek 6-pack carrier measures 171mm x 117mm, with the aperture designed for perfect fitting to each can during application. Due to the body of the sleek cans being smaller, the apertures are closer together, with the pitch adapted to ensure a perfect fit and provide the strength and durability WaveGrip is known for. It can be applied across the range of WaveGrip applicators, which are easily integrated by WaveGrip’s OEM partners into production lines by brewers and beverage manufacturers.